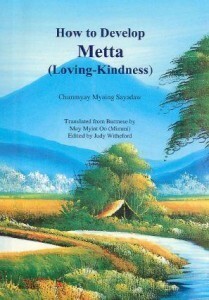 How to Develop Metta – Loving Kindness – by Chanmyay Myaing Sayadaw is another newer (2007) book from the Bodhiyarama Hermitage in Malaysia. According to the scriptures, metta is the wish for the welfare and happiness of all living beings. Metta only wishes for the well-being of all living beings, metta has no expectations and desires nothing. This free ebook will guide the reader through the methods of working with and developing metta as it is done in the Malaysian Theravada traditions through retreats, meditation and storytelling – the book has some cute stories. Read for example “The Story of the Wild Elephant“.